You can find these warm, doughey, melted sugar and cinnamon-filled treats at street stalls! Canadians: it’s like an inside out Beavertail! Careful, the insides are HOT! Pork belly bbq, eaten in a lettuce wrap. I’ve gone into detail about this and a few other tasty meats in this post, as well as some of the restaurants where you can get them. I recommend the chain Kimbap Cheonguk– look for this orange sign “김밥천국”. This is comfort food that’s perfect on a cold winter day! 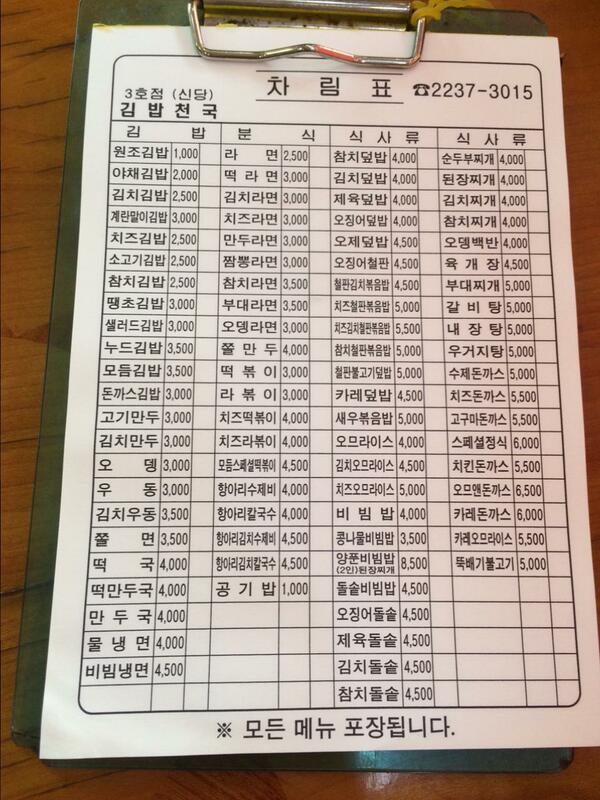 The menu will look something like this, and you write the quantities beside the items you want to order. Kimbap (김밥) is always a good, easy, snack. It’s a rice wrap with seaweed on the outside and your choice of ingredients inside – I like tuna! My favourites are other things though: kimchi fried rice (“bokeumbap” – 김치 볶음밥), , donkatsu (breaded pork cutlet – 돈까스), kimchi dumplings (“kimchi mandu” – 김치만두) and hot or cold bi bim bap (rice/veg/egg mix bowl – 비빔밥). When it’s hot you get crispy rice on the bottom of the sizzling bowl – yum! Spicy chicken, cabbage, and various other things stir fried at a grill at your table. At some chains you can order it with all kinds of extra unhealthy-but-delicious things. Read more. This speaks for itself; matcha lattes are sweet and Seoul-warming (har har), indulging at one of Seoul’s many hyegge cafes makes the experience even better! Pajeon is a fried savory pancake, and usually at these places you can also order tons of other delicious fried things, like stuffed perilla leaves or peppers, which come with yummy dipping sauce. (Usually you can get some sort of “mix” plate.) Makgeolli is the opaque, sweet/tart rice wine that accompanies pajeon. It usually comes in a kettle, and you drink it out of metal bowls! Holy bulgogi my mouth is watering. Thinly sliced, spicy pork, grilled at your table. You want to visit 세마울 chain to eat this. Read more. If you’re really keen to keep the meat coming, check this one out too! It’s more grilled-at-your-table pork, but this is one you dip rather than roll in lettuce. It heats up on a grill in the centre of a moat full of egg! Soju + beer (maek-ju) = somaek! You’re welcome for the hangover. Chicken + maek-ju = chimaek! Fried or spicy sauce chicken plus tons of side dishes plus beeeer! There are also lots of chains that sell insanely tasty boneless fried chicken: Frypan is one of my favourites. The Korean version of Japanese hot pot. Thinly-sliced beef and veg that you cook in a boiling broth at your table. Dip and enjoy! Fish-shaped pastry filled with sweet read bean paste! Find these at street stalls. You can even buy an ice cream version at convenience stores! Spicy, glutinous/sticky rice cakes! You can easily find this at a street stall in Myeongdong, or you can find versions with extreme toppings at chains that specialize in this dish (think hotdog, cheese, hard-boiled eggs, ramen noodles)! Quintessential vibrant Seoul. This is a busy shopping area, with big brands, bright lights, and lots of cute, cheap street stalls. You can also try lots of street foods here, and shop underground! Plus, it’s the station for Seoul Tower/Namsan (see below)! Definitely a must-see. Another essential visit! Insadong is the neighbourhood where tourists can readily experience traditional Korea, plus lots of good food, tea shops, buskers, street food, and neat stores! It’s a little pricey to actually *buy* souvenirs, but it’s definitely worth a walk down the main street. It’s close to Gyeongbokgung Palace, Cheonggyecheon Stream, and Gwanjang Market, as well as Bukchon Hanok Village. There’s also a poo bread stall and poo cafe here!!! Such a cool neighbourhood! This is one of the places where young, hip people hang out (I hung out here sometimes too :P). Loads of nightlife, and delicious restaurants. Hongik University Station Exit 9 is the place where everyone congregates before going out – ie. a chaotic place to place to meet your friends! There are also a handful of lesbian bars in Hongdae, like Pink Hole and Labris. Note that these bars only allow women! Hongdae isn’t too far from Incheon Airport, so it’s a good place to stay on your way in or out of Seoul. This is a big expat neighbourhood, near the US army base. I used to go here for foreign food and groceries, but that’s less relevant when you’re visiting Korea and want to eat Korean food! It is a great place to find gay bars! There’s an aptly-nicknamed alley called “homo hill“ with a handful of bars and clubs. Back in 2012-2015, Soho was really fun; it’s small and always gets packed on the weekend, but it’s the place to go for gay anthems and the best dance parties! Everyone’s heard of Gangnam, duh! This is a pricey, upscale area, south of the Han River. It’s cool to explore; some areas of interest are: Garosu-gil in Sinsa (fancy shopping and lots of plastic surgery clinics), Bogeunsa Temple, Spa Lei (women’s only) jjimjilbang, underground shopping, and Jamsil station, if you’re heading to Lotte World! There are a crazy amount of love locks at the base of this tower, and it’s a fun place for couple-watching! If you’re not feeling romantic, the tower observatory is still a great place for views of the city. This is my top palace recommendation. You can watch the colourful changing of the guard ceremony for free! Just make sure you check the times; it’s worth seeing! In the summer, I’d pay admission and check out the gardens, but in the winter, you can probably get the gist of it by stepping inside the free courtyard area. A good stop on the way to Insadong! THIS IS MY TOP RECOMMENDATION! If you’re comfortable with it, you can bathe (naked style!) in relaxing hot and cold baths. Get a body scrub from an older Korean woman, if you dare – your skin will feel like butter afterwards! Then, relax in the dry spa area, with different saunas and themed rooms (e.g. salt room, ice room). Dragon Hill was my favourite! Here’s more information about getting naked with strangers. This park is huge and beautiful in all seasons; in the winter there’s a big skating rink in front of the World Peace Gate for only 3000 won, including skate rentals! Private karaoke rooms! Sing whatever songs you want! Or just hang out and play tambourine with your friends! There are noraebangs everywhere in Seoul, and you should definitely try this at least once. If you’re into animals! I know these are taking over North America these days, and I have yet to visit one here! In Seoul, doggos and cattos are everyyywhere while you enjoy your coffee! I hear you can even go to the next level and visit sheep cafes, so make sure to do some googling! I’ve done this in the winter, and it was gorgeous! You’ll probably want to check for recent info on transportation, but there are amazing hikes in North Seoul that are accessible by public transit. Dobongsan Station is one option, and even visiting the base of the mountains is an experience! Loads of outdoor/hiking stalls, as well as places you can buy snacks (pajeon and majgeolli are common!?!) for your hike! The site of an annual lantern festival in November, this downtown stream is a great setting for a walk! Foood, glorious food!!! Near Insadong. You may want to check out a Korean Buddhist temple. If you’re in Gangnam, Bogeunsa is a good option. Kind of neat seeing the juxtaposition between the serene temple and Gangnam skyscrapers! If you’re in Insadong, Jogyesa is nearby. If you’re into amusement parks, there are a few options in Seoul. Lotte World is a good, central option! Head to Jamsil (home of super-popular baseball games in the summer). I’m not a huge museum person, but I learned so much about the Korean war here. Plus, it’s free!?! If you want to learn more about Korean history and have some extra time, this is definitely a worthwhile stop. If you have the time, this is one of the most interesting places you can visit in South Korea. Although it’s more expensive and requires a bit more pre-planning, I highly recommend visiting Panmunjom, the Joint-Security Area between the two Koreas. This generally includes a stop at the Unification Village in the DMZ, where you can lookout into the area between the two countries. In the JSA, you can walk around a table where you’re technically in the North on one side, and in the South on the other. You’ll see guards on either side of the border, and although it can feel very tense, it is a great learning experience. In general, you’ll stay at a temple for a night, do 108 prostrations (full bows) at… 5ish in the morning, spend some time meditating, eat locally-grown food alongside the resident monks, and have a Q&A session with a monk. It’s not the most *relaxing* overnight, but again super interesting! Ok, confession: I’m into toilet/poo-themed things cause I’m a three-year-old child at heart. If you want a really bizarre experience outside the city, head to this toilet-shaped, toilet-themed museum in Suwon! You can also check out Suwon’s fortress while you’re down there. *I’ve left out foods and activities that are more enjoyable/only available in the summer (e.g. patbingsu and naengmyeon! Riding your bicycle along the Han River! Watching the water/light show at Banpo Bridge!) It’s also pretty Seoul-focused, so I’ve left out trips to places like Busan, Seokcho, and Jeju Island, even though I highly recommend them! Let me know if you have questions about any of these places or sights.